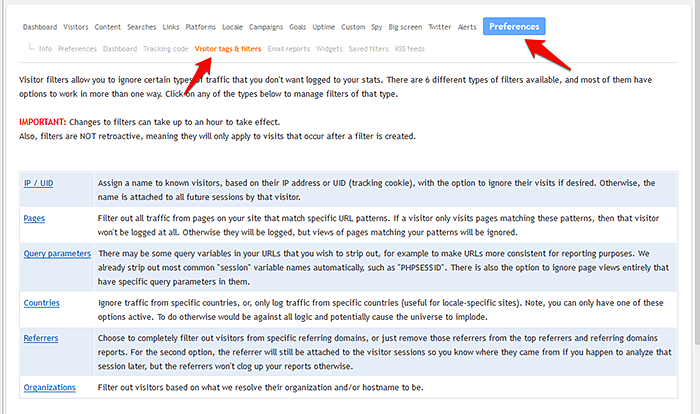 Beyond filtering visitors by IP/UID, there are 4 other types of filters, as mentioned in the title of this article. You can find this filtering configuration area in the site preferences area for any of your sites, as shown in the screenshot below. You can create both site-specific filters, and global filters, which apply to all sites in your account. If you create any kind of filter for a site, and you also have global filters of the same type set up, both sets of filters will apply to your traffic for that site. More information about each filter type can be found on the filter configuration screen.